For Whom Are You Grateful Today? I am thinking of Percy Dillard today. 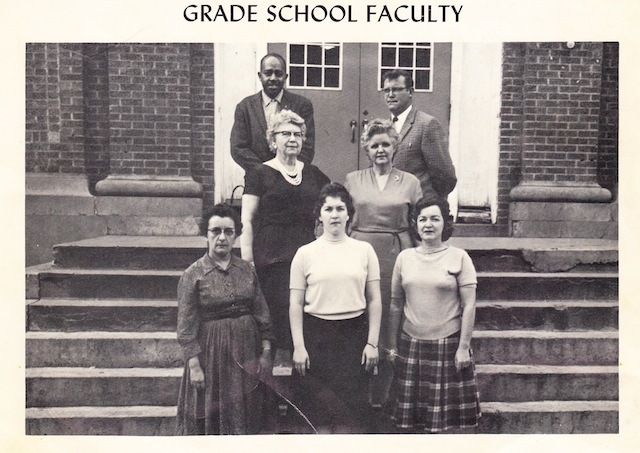 My second grade teacher, Mr. Dillard terrified me at the beginning of the school year that fall of 1963. He wore a black glove on one hand, which I think he had injured in World War II. As if that weren’t scary enough, he announced on the first day of school that we would have a spelling test every Friday—and that for every word we missed, we would get a lick with his long wooden paddle, which still looms large in my mind after 50 years. For first grade, I’d had Mrs. Fenny, a chubby, friendly woman who mothered all of us. Mr. Dillard had none of her qualities. He was a black man, the only black teacher in my elementary school, and I only know now how unusual that was, even today—for a second grader to have a teacher who is male and black. And I didn’t. Mr. Dillard became less scary each Friday, and I still remember that he told us that we were all equal in his room and that what would set us apart was how hard we worked. That November, Mr. Dillard stood at the chalkboard, the classroom door open, when Mrs. Fenny came running to the door, tears streaming down her face, and said shrilly, “The president has been shot!” Mr. Dillard turned slowly to face her and put the chalk down in the tray. He stepped outside the door and closed it, and we children watched in silence as they talked. Mr. Dillard returned, sitting heavily at his desk. He looked at us sadly and said, “Children, our president is gone. And we’re sending you home to be with your families.” He watched stoically as we gathered our things and went home to watch the television coverage of the stunning loss of a leader with such promise for the future. In the past four years, I’ve heard President Obama’s critics say that Jack Kennedy was the last great democratic leader. But President Kennedy’s critics said much the same thing about him in the years he was in office before a tragic and early death catapulted him to the ranks of the greatest presidents. And, thinking of that day, it’s hard for me to breathe when President Obama is surrounded by hordes of people, as he is today for the Inaugural Parade. I wish Percy Dillard had lived to see President Obama inaugurated, but Mr. Dillard died in 2001. I would never have called him my favorite teacher—I loved the motherly ones who told me how gifted I was. But I feel fortunate to have spent a year in Mr. Dillard’s class. He was the only elementary teacher I had to work hard to please. And he taught me that effort was the great equalizer. A few years later my dad lost his job, and my family moved to an all-white town in the next county where another coal mine was hiring. I would not have another African-American teacher or have classes with people of other races until I got to college. But because of Percy Dillard, I grew up knowing that diversity is a positive thing and that overcoming discrimination in all its insidious forms is essential. Mr. Dillard, while spell-check now makes it less important never to misspell a word, I know that you taught me far more important lessons. And I hope you’re up there somewhere today, watching, and knowing that, like President Kennedy and President Obama, you have a legacy.